The month kicked off with a wet Stourbridge Stagger after more than 24 hours of constant rainfall ensured that conditions would be, at best, testing and at worst bottomless. James Wright was first home for the blue hoops in 22nd place in 1.14.08, however things could have been so different as Wright was in the lead from the start and had opened up a sizable gap before succumbing to injury, a recurring shin problem forcing him to slow up and drop back through the field. Dave Norman was second home in 42nd place in 1.17.09, Mick Quane was 50th in 1.18.14, Mark Homer was 65th in 1.21.18 just holding off Mark Gallimore a place behind in 1.21.26, Helen Tromans was 103rd and 2nd in her age group in 1.26.02, Paul Silk placed 127th in 1.28.29 with Tracey Alderson in 130th in 1.29.25. , Graham Wildgoose finished in 1.35.27 to take 171st, Carol Fisher was 193rd in 1.37.49, Dave Hickman was 201st in 1.38.46, Sally McConville was 248th in 1.43.29, Karen Doy came home in 1.46.11 for 271st and Kathryn Sneyd was 304th in 1.50.05. In the separate women’s race over 7k Lyn Sprague was first and only DK lady home in 10th place in 38.10. Elsewhere for DK Andy Sprague took part in the Long Mynd Valleys race over 18 of Shropshire’s hilliest miles to come home in 67th place in 2.21.40. It was almost a lap of honour as the club competed in the final Birmingham and District Cross Country League fixture in Gloucester. With a sizable lead at the top of the table only a disaster could have prevented the blue hoops from taking the title but with road works and a build-up of traffic en-route that disaster was looking a possibility, but despite a few nervous moments as the clock ticked closer to the start they arrived in plenty of time, if a little frayed. Despite a lead there was still a desire to finish the season in style and there was no relaxing around the 4 lap course around Plock Court. Although flat the conditions were boggy and cut up, in some areas flooded and poached from the University Championships held at the same venue the previous week. Ben Foster led the hoops home in 2nd place in 36.51 with Rob Meredith taking 3rd in 36.58. Matt Biggs claimed 8th place and James Wright finished 11th. Dave Norman and Stuart Perkins claimed 20th and 21st positions respectively to complete the A team but there was a procession of DK runners stacked up behind them with Simon Hughes 22nd, Rich Bate 23rd, Rob Sannwald 27th, Kevin Duckworth 36th, Darran Bishop 44th, Mark Homer 46th completing the B team. Andy Sprague crossed the line in 58th, Mark Gallimore 72nd, Mark Judge 74th, Graham Wildgoose 81st, Kieran Pitt 84th, Paul Silk 92nd, John Sixsmith 104th, Sergey Lyubovnikov 114thand John Andrews finished in 140th. With the A team scoring a mere 65 points, almost half that of their nearest rivals on the day, victory was assured. In fact the B team would have also placed highly in 3rd with DK sandwiching the days hosts Severn AC. This performance cemented DK’s position at the top of the table, taking the title in commanding fashion with a mere 266 points over 4 races with Northbrook AC runners up on 601 points and Sparkhill Harriers taking 3rd on 643. DK’s B team also picked up a championship trophy with 983 points with Sparkhill 2nd on 1584 and Northbrook 3rd on 1839. Elsewhere, while the men were enjoying their successful campaign, the ladies were closing their season around another muddy field in Wolverhampton. Tracy Alderson was first to cross the line for the hoops in 77th place stopping the clock in 27.40, Rebecca Warren finished 146th in 30.36, Karen Doy 158th in 31.01, Carol Fisher 161st in 31.07, Lynn Sprague 186th in 32.21, Sarah Cox 205th in 33.44, Sally McConville 213th in 34.07, Jane Campbell 245th in 36.45, Lisa Newell 264th in 40.02 and Sarah Krivosic 267th in 40.29 to place 22nd of the 34 clubs competing. The month came to a close with the end of a busy cross country season and a final run round muddy fields at the National Cross Country Championships at Donington Park. With the cream of the cross county crop heading for the Leicestershire venue this was like a cup final for the blue hoops and an opportunity to rub shoulders, albeit briefly, with international athletes as this would be a whole different game to their usual West Mids League and Birmingham League Division Three outings. With the first four finishers to count in the ladies team standings Lynn Sprague was first home for DK in 453rd in 44.15, Carol Fisher placed 541st in 46.48, Hannah McGuire finished in 47.14 to take 547th place and Sarah Cox was 583rd in 48.29 to place the club 75th overall of the 84th clubs competing. Sally McConville was 601st in 49.06 and Sarah Krivosic finished in 1.01.18 in 725th. In the Senior Men’s race the blue hoops lined up in the same starting pen as defending champion Charlie Hulson from Sale Harriers but were soon left behind as the gun fired prompting the cavalry charge to the first bend. Ben Foster was first back in 300th place in 50.26, Stuart Perkins had a fantastic run to place 625th in 55.26, James Wright was 686th in 56.12 despite carrying an injury, Simon Hughes was 814th in 57.45 just holding off a fast finishing Dave Norman in 818th in 57.47 with Daren Thompson completing the A team scorers in 59.15 just ahead of Mark Homer who placed 966th in 59.47. Andy Sprague was 1156th in 1.02.38, Mark Judge 1297th in 1.04.58, Graham Wildgoose 1366th in 1.06.21, Stephen Parr 1474th in 1.09.09, Pete Krivosic 1674th in 1.20.18 and Matthew Harker finished in 1.22.00 in 1689th out of a total field of 1730 runners. As a club the men’s team finished 61st out of 123 teams. Twenty four hours later and back on tarmac there were plenty of hoops on show for the Action Heart 5. Darran Bishop was first back in 22nd place in 31.39, Sergej Ljubovnikov was 45th in 35.20, Darren Marklew 70th in 37.09, Roger Beddard 71st in 37.10, John Andrews 83rd in 37.44 Tom Cobb 122nd in 40.22 and Rory Campbell was 159th in 42.10. Sally McConville finished in 43.31, Jane Campbell 44.13, John Glover 45.31, Nick Murphy 45.31, Zoe Marklew 47.05, Tracey Nicholls 50.06, John Gould 50.47, Jeremy Cobb 52.33 1nd Susan Hughes 1.01.18. 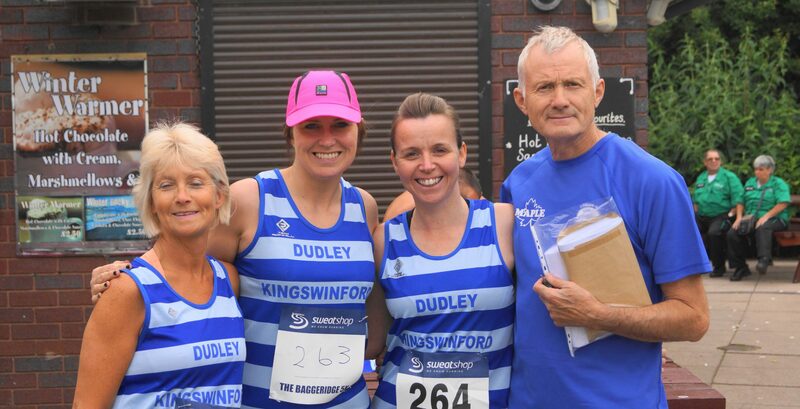 And while some were content to run around Dudley a couple made the short trip to Coventry for their half marathon, Rob Meredith clocked 1.19.44 to take 40th place and Karen Doy finished in 1295th in 1.47.37..